Electric Bird Noise is the longtime solo ambient project of Brian McKenzie. 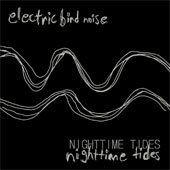 He has a half dozen releases under his belt at this point, and Nighttime Tides is his most recent. First off, let me state that i get why this might not be for everyone. Nighttime Tides is just under thirty-three minutes of wandering ambient drone, one long track that burbles along slowly. That said, i think that this is one of the prettiest things that Electric Bird Noise has done, and that is really saying something. McKenzie has been at this for a while, and it shows in the way that the song flows slowly, effortlessly, just an ambient haze. To me, the track seems very sci-fi. There are deep rumbles, whooshing sounds that shoot by, and odd trills that sound robotic. When i listen i imagine a vast craft travelling through the void, the nighttime that the title mentions. Apparently McKenzie wrote it about watching the ocean ebb and flow. Whatever. The great thing about this type of music is that you can add whatever mental visuals you want. Fans of ambient will want to track this one down.